Vermont’s only 24-hour animal hospital will triple in size and move to Marshall Avenue under a plan the Williston Development Review Board approved in concept last week. Burlington Emergency & Veterinary Specialists — BEVS — is currently located in a 5,000-square-foot building at 200 Commerce Street in Williston. Owners have their sights set on a vacant Marshall Avenue parcel to construct a 17,000-square-foot facility. Business owner and veterinarian Bryan Harnett said he expects the business to double in volume with the expansion. BEVS provides an all-hours, walk-in emergency room, as well as scheduled surgery, oncology, rehabilitation and acupuncture for pets. 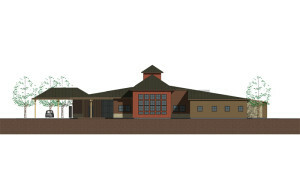 The size of the building’s parking lot was a focus of discussion for the development review board. “We don’t want to do something that’s going to hold the business back,” board chair Scott Rieley said, adding that the board is also mindful of minimizing impervious surface to reduce environmental impact. Preliminary plans are designed with an 85-space parking lot, but project engineer Ian Jewkes of Krebs & Lansing Engineers said that can be reduced when refined plans are submitted ahead of a future meeting. Harnett noted that BEVS employs about 65 people over three shifts, and its current 40-space lot often fills up. Jewkes said the traffic impact of the project is not aligned with morning or afternoon commute times. The board did not request a traffic study. The veterinarians designed a conference room into the building with a capacity of 90 people. Harnett said BEVS, which relies on referrals from other local vets for animals needing specialized care, plans to use the room for staff meetings, networking events and as a community space. The board voted unanimously in favor of moving the application to the discretionary permit stage of review. Copyright © 2019 Burlington Emergency & Veterinary Specialists. All Rights Reserved.